On May 15, we turned the page on Asterisk® GUIs by introducing a new GUI that hopefully provides the best of both worlds. It preserves the GPL components of the FreePBX® product that many of us have nurtured for almost a decade while removing the commercial pieces that have introduced some friction into the equation for users and companies that simply wished to deploy or redistribute a graphical user interface for Asterisk in accordance with the free GPL licenses under which the product and its components were licensed. Last week we did much the same thing with the essential cloud component which serves as the lynchpin for GPL module administration within the GUI itself. Hopefully, these two tweaks will encourage Sangoma, the new owner of the FreePBX project, to do the right thing and get the non-commercial pieces of the project back on the right track moving forward. What we did not want to do was tarnish the incredibly hard work that dozens of developers in the open source community have poured into this project over the past decade. We continue to be amazed at what they’ve been able to achieve, and we salute their accomplishments. The Asterisk 12 and 13 revolution never would have been achieved without the contributions of the FreePBX development team. We think the new Incredible PBX GUI stands as a testament to what can be accomplished while preserving the true spirit of open source development and the terms of the GPL licenses under which this product and its numerous modules were licensed. Two weeks ago, we introduced the all-new Incredible PBX with Incredible GUI for CentOS, Scientific Linux, and Oracle Linux. Last week we added a Cloud-based GPL repository and all the tools necessary to maintain it. Today we’re pleased to release the production-ready version for the Ubuntu 14 platform with all the bells and whistles including Incredible Fax featuring HylaFax and AvantFax. Today’s release mimics the functionality of the previous build for the CentOS platform with literally dozens of turnkey applications that show off the very best features of Asterisk®. In addition to Incredible PBX, you also get our new GPL repository to maintain release 12 of the GUI. No strings, no gotchas, and no murky licenses. Pure GPL! If you’re new to VoIP or to Nerd Vittles, here’s our best piece of advice. Don’t take our word for anything! Try it for yourself in the Cloud! You can build an Ubuntu 14.04 image on Digital Ocean in under one minute and install today’s Incredible PBX for Ubuntu 14.04 in about 15 minutes. Then try it out for two full months. It won’t cost you a dime. Use our referral link to sign up for an account. Enter a valid credit card to verify you’re who you say you are. Create an Ubuntu 14.04 (not 14.10!) 512MB droplet of the cheapest flavor ($5/mo.). Go to the Billing section of the site, and enter the following promo code: UBUNTUDROPLET. That’s all there is to it. A $10 credit will be added to your account, and you can play to your heart’s content. Delete droplets, add droplets, and enjoy the free ride! For today, we’ll walk you through building your own stand-alone server using the Ubuntu 14.04 mini.iso. If you’re using Digital Ocean in the Cloud, skip down to Installing Incredible PBX 11-12 (HINT: 11 tells you the Asterisk release and 12 tells you the GUI release). If you’re using your own hardware, to get started, download the 64-bit Ubuntu 14.04 "Trusty Tahr" Minimal ISO from here. Then burn it to a CD/DVD or thumb drive and boot your dedicated server from the image. Remember, you’ll be reformatting the drive in your server so pick a machine you don’t need for other purposes. For those that would prefer to build your Ubuntu 14.04 Wonder Machine using VirtualBox on any Windows, Mac, or existing Linux Desktop, here are the simple steps. Create a new virtual machine specifying the 64-bit version of Ubuntu. Allocate 1024MB of RAM (512MB also works fine with a swap file) and at least 20GB of disk space using the default hard drive setup in all three steps. In Settings, click System and check Enable I/O APIC and uncheck Hardware Clock in UTC Time. Click Audio and Specify then Enable your sound card. Click Network and Enable Network Adapter for Adapter 1 and choose Bridged Adapter. Finally, in Storage, add the Ubuntu 14.04 mini.iso to your VirtualBox Storage Tree as shown below. Then click OK and start up your new virtual machine. Simple! 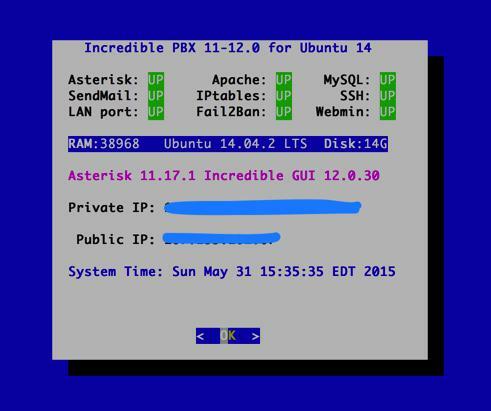 Adding Incredible PBX 11-12 to a running Ubuntu 14.04 server is a walk in the park. To restate the obvious, your server needs a reliable Internet connection to proceed. Using SSH (or Putty on a Windows machine), log into your new server as root at the IP address you deciphered in the ifconfig step at the end of the Ubuntu install procedure above. First, make sure to run the update step for Ubuntu below before you begin the install. This is especially important if you’re using a cloud-based Ubuntu 14 server. WARNING: As of early June, 2016, Ubuntu has introduced a bug in their latest MySQL upgrade. Do NOT run apt-get upgrade for the time being, or your Incredible PBX install will fail. WARNING: If you’re using a 512MB droplet at Digital Ocean, be advised that the DO Ubuntu setup does NOT include a swap file. This may cause serious problems when you run out of RAM. Uncomment ./create-swapfile-DO line below to create a 1GB swap file which will be activated whenever you exceed 90% RAM usage on Digital Ocean. Incredible PBX includes an automatic update utility which downloads important updates whenever you log into your server as root. We recommend you log in once a week to keep your server current. Now would be a good time to log out and back into your server at the Linux command line to bring your server up to current specs. When the Kennonsoft menu (shown above) appears, click on the User tab to open the Admin menu. 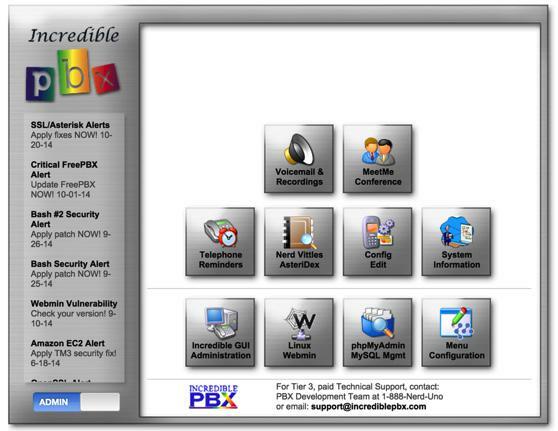 Then click on Incredible GUI Administration to access the Incredible PBX GUI. The default username is admin with the randomized password you wrote down above. If desired, you can change them after logging into the GUI by clicking Admin -> Administrators -> admin. Enter a new password and click Submit Changes then Apply Config. Now edit extension 701 so you can figure out (or change) the randomized passwords that were set up for default 701 extension and voicemail: Applications -> Extensions -> 701. The next step is establishing an interface on your PBX to connect to the telephones in the rest of the world. If you live in the U.S., the easiest way (at least for now) is to use an existing (free) Google Voice account. Google has threatened to shut this down but as this is written, it still works with previously set up Google Voice accounts. The more desirable long-term solution is to choose several SIP providers and set up redundant trunks for your incoming and outbound calls. The PIAF Forum includes dozens of recommendations to get you started. If you want to use Google Voice, you’ll need a dedicated Google Voice account to support Incredible PBX. If you want to use the inbound fax capabilities of Incredible Fax 11, then you’ll need an additional Google Voice line that can be routed to the FAX custom destination using the GUI. The more obscure the username (with some embedded numbers), the better off you will be. This will keep folks from bombarding you with unsolicited Gtalk chat messages, and who knows what nefarious scheme will be discovered using Google messaging six months from now. So keep this account a secret! We’ve tested this extensively using an existing Google Voice account, and inbound calling is just not reliable. The reason seems to be that Google always chooses Gmail chat as the inbound call destination if there are multiple registrations from the same IP address. So, be reasonable. Do it our way! Use a previously configured and dedicated Gmail and Google Voice account, and use it exclusively with Incredible PBX 11. You can avoid one-way audio on calls and touchtones that don’t work by entering these simple settings in the GUI: Settings -> Asterisk SIP Settings. Just plug in your public IP address and your private IP subnet. Then set ULAW as the only Audio Codec. Here’s how to activate speech recognition on Incredible PBX. Don’t skip any steps! Incredible PBX for Ubuntu 14 is a very secure, turnkey PBX implementation. As configured, your server is protected by both Fail2Ban and a hardened configuration of the IPtables Linux firewall. Nobody can access your PBX without your credentials AND an IP address that is either on your private network or that matches the IP address of your server or the PC from which you installed Incredible PBX. Incredible PBX is preconfigured to let you connect to many of the leading SIP hosting providers without additional firewall tweaking. Accept all of the defaults during the installation process. IMPORTANT: Once you complete the install, reboot your server. After rebooting, log into the GUI and choose Module Admin and enable the AvantFax module. When you log out of the GUI, there now will be an option for AvantFax on the GUI’s main login screen. Choose it and enter admin:password to login and change your default password. You also can set your AvantFax admin password by logging into the Linux CLI and… /root/avantfax-pw-change. We’re pleased to introduce our latest backup and restore utilities for Incredible PBX. Running /root/incrediblebackup will create a backup image of your server in /tmp. This backup image then can be copied to any other medium desired for storage. To restore it to another Incredible PBX 11 server, simply copy the image to a server running Asterisk 11 and the Incredible PBX 11-12 GUI. Then run /root/incrediblerestore. Doesn’t get much simpler than that. Every time you log into your server as root, Incredible PBX will ping the IncrediblePBX.com web site to determine whether one or more updates are available to bring your server up to current specs. We recommend you log in at least once a week just in case some new security vulnerability should come along. Also be sure to check the PBX in a Flash RSS Feed inside the GUI for the latest security alerts. Your next stop should be a quick read of the Application User’s Guide for Incredible PBX. Even though the target audience was Raspberry Pi users, the feature set is identical, and this guide will tell you everything you need to know about the dozens of applications for Asterisk that have been installed on your new server. We also want to encourage you to sign up for an account on the PIAF Forum and join the discussion. In addition to providing first-class, free support, we think you’ll enjoy the camaraderie. Come join us! Any idea when Asterisk 12/13 versions of the Incredible GUI/PBX will be released? Could I add the Incredible PBX applications to the FreePBX Distro? Or is the FreePBX Distro no longer supported? Ward, I want to try your offerings pretty bad, but sourceforge is serving up corrupted images to me on the virtualbox download. Bad luck I’m sure, but can we please get a torrent started somewhere? I’ll be happy to seed it. A slightly modified install for the Debian 7 (Wheezy) platform is now available as well. Tutorial here. First off let me congratulate you on this fine project. I have been running Asterisk servers for several years and can appreciate all the work that went into this build. I have started to experiment with Digital Ocean as a server platform. I prefer a "cleaner" installation, without all the bells and whistles (think wake-up calls, FAX capability etc) but Digital Ocean dos not presently offer the ability to build a server utilizing an ISO. Yours is the only how-to I have recently experimented with that will produce a functional server. I have build two Digital Ocean VPS systems as experiments and have noticed a few errata you may be interested in. 1. "Create admin password for web apps: htpasswd -b /etc/pbx/wwwpasswd admin newpassword" (does not work, needs a package to implement but the system handy informs you what to load). 2. "Make a copy of your other passwords: cat passwords.FAQ" (no such file in the root directory). The GUI main status page list four connections before anything is operational. Looking further theses are IAX@ peers, iax-fax0 thru 3. I could not find any way to delete these. As I will not implement any FAX capability I would like to see the actual "operational" connections in the GUI main page so I can quickly see if everything is operational. As I mentioned, I prefer a bare server installation that I can then add to vice the "soup to nuts" approach. It’s peanuts from the gallery but you may want to consider offering a "cleaner" installation as an option for users who prefer that style of installation. One other observation I can make is the the locking down of the server and client ip address in iptables does not work when using a Digital Ocean droplet unless the server is run 7/24. Each time the Droplet is created from a stored image it gets a new ip address. Additionally, most admin users, especially SOHO (clients), do not have a static ip and since the server is not on the admin LAN this is an issue. Again, a great project, I would appreciate if you could post how to delete the IAX FAX connections.